Nature has developed processes and robust materials, which possess superior physical, chemical, and electromagnetic properties that can withstand the most extreme conditions. We need to take inspiration from nature to obtain a more sustainable development. By combining our knowledge of processes and the knowledge of natural systems, we can create “biomimetic” solutions to the problems that we are facing as a consequence of the over-exploitation of our natural resources. 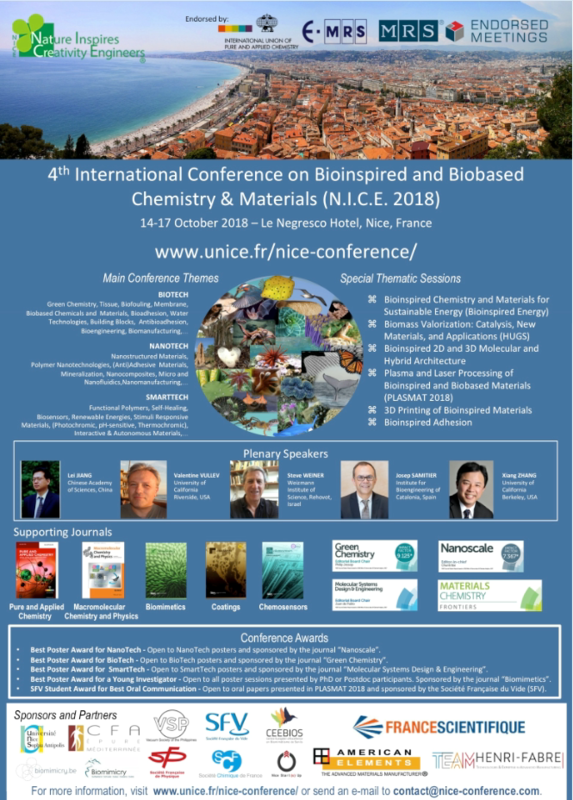 Nice, France, the capital city of the French Riviera, once again welcomes the 4th edition of the International Conference on Bioinspired and Biobased Chemistry and Materials (“Nature Inspires Creativity Engineers” or N.I.C.E. 2018 Conference) from 14 to 17 of October 2018. As in the previous editions, we are expecting hundreds of scientists and engineers to share the latest developments in the growing field of bioinspired and biobased chemistry and materials. It is a unique opportunity to understand the new challenges, to initiate new collaborations and to envisage sustainable solutions for the future. The main conference themes are NanoTech, SmartTech, and Biotech. Also, for this year’s edition, there will be six special thematic sessions, namely: (1) Bioinspired chemistry and materials for sustainable energy, (2) Biomass valorization: Catalysis, new materials, and applications, (3) Bioinspired 2D and 3D molecular and hybrid architecture, (4) Plasma and laser processing of bioinspired and biobased materials, (5) 3D printing of bioinspired materials, and (6) Bioinspired adhesion. This wide range of topics to be presented in the conference is a great opportunity for biologists, chemists, physicists, engineers, technologists, and innovators to work together in creating biomimetic solutions for our planet. For more information you can visit http://www.unice.fr/nice-conference/ or send an e-mail to contact@nice-conference.com.